We shall observe and preserve the Buffalo wings tradition! Many of you have probably noticed that your nearby Mexican restaurant has chicken wings on the menu. The question is – are they Buffalo? The Wing Authority paid a visit to a spot in Cleveland and even though lots of menu items looked tasty (and in fact were, according to my companions), the question of whether the wings were Buffalo or not had to be answered, so I ordered a delicious dozen. The server warned me they were hot and to be honest, I wasn’t too sure what to expect from the creamy dipping sauce that came along. No blue cheese? What the hell. El Jalapenos was not crowded or noisy, a perfect casual family dining experience. You can’t beat the price for 12 wings at $6.99. They were good. They were fried crispy and the tasty red sauce was far from overwhelming – despite the warning I received. The breading was a bit thick for my liking but the sauce was totally Buffalo. Oh alright. We’ll give them a pass for not offering blue cheese since their wings are not a featured item and Mexican food as a whole doesn’t exactly make much of blue cheese. Give these guys a shot. 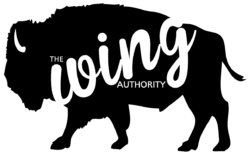 The Wing Authority is eager to explore more ethnic restaurants – Mexican, Chinese, Thai, Caribbean, etc. We’ll continue to let you know whether the wings are totally Buffalo, and we will continue to observe and preserve the Buffalo wing tradition!